Umaru Jutte is a Nationally Board Certified practitioner of Acupuncture and Oriental Medicine. He has 42 years’ experience, including foreign training and a Master’s Degree in Classical Chinese Medicine. 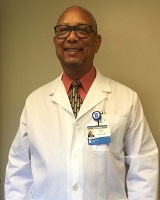 Umaru is also a St Thomas trained RN, with experience in Cardiac, Renal and Transplant Medicine. Umaru's areas of focus include Fertility and PCOS, Musculoskeletal Pain, Neuropathy and support for Patients in Cancer Treatment. Stress therapy and Autonomic Dystonia comprise his 5th area of practice.